Join us for an exceptional evening, specifically designed for Businesses of all sizes starting with a meet and mingle and then Author speaking and signing event. Complimentary show case of our top 3 appetizers: Artisan cheeseboard, hand crafted Guacamole and chips, hand crafted Hummus accompanied by za’atar , and market vegetables lavish crackers & cash bar . Three Minnesota authors and consultants with expertise in leadership training, productivity growth and organizational development. 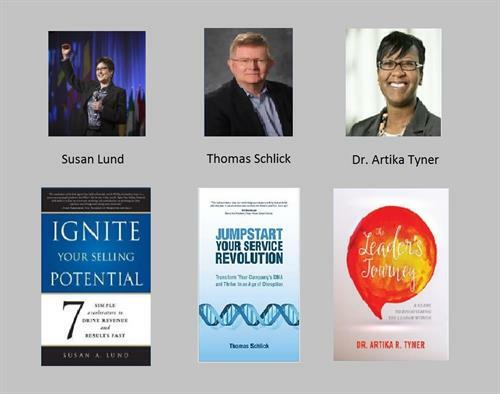 Susan A. Lund is the author of Ignite Your Selling Potential: 7 Simple Accelerators to Drive Revenue and Results Fast and president of MR3, a sales, leadership and productivity consulting firm in Minnetonka, MN. She has 30 years of experience in sales, business, sales leadership/coaching/training, productivity and executive coaching, holds an Executive M.B.A. from the University of St. Thomas, and is a certified coach, speaker and member of “The John Maxwell Team.” She is the premier consultant for helping organizations grow revenue and increase productivity to create predictable, sustainable and profitable results fast. Thomas Schlick is the author of Jumpstart Your Service Revolution: Transform Your Company’s DNA and Thrive in an Age of Disruption and a customer-focused Business Operations Executive with an expertise in moving from vision and strategy to tactical development and implementation within services businesses. He holds an M.B.A. in Finance from the Carlson School of Management and is a certified Lean Six Sigma Black Belt. His industry experience spans healthcare/medical devices, process control, transportation/trucking, secure ID/financial services and office products and equipment. Dr. Artika Tyner is the author of The Leader’s Journey, and professor of public policy/leadership at the University of St. Thomas College of Education, Leadership and Counseling. She trains graduate students to serve as social engineers who create new inroads to justice and freedom and teaches leadership coursework on ethics, critical reflection and organizational development. She holds a Master of Public Policy and a Doctorate in Leadership and has had speaking engagements on leadership, civil rights, diversity and social justice topics around the world.